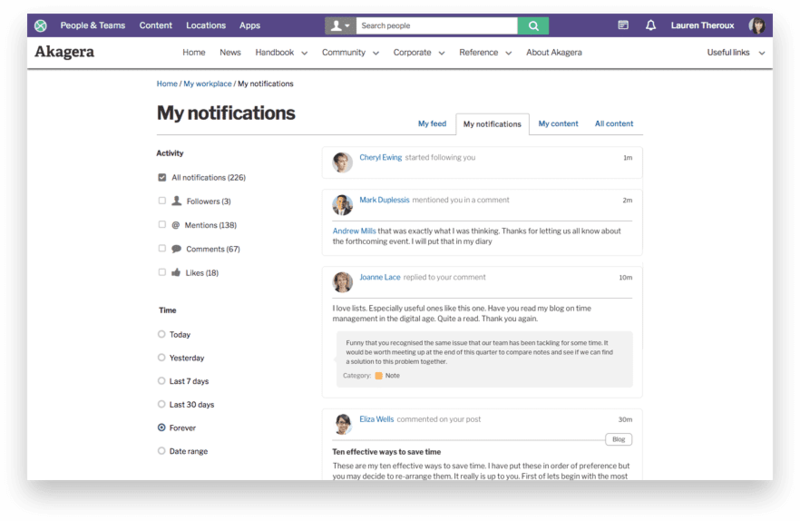 Maintaining engagement with your intranet and content is facilitated with Invotra notifications, which send a message to users whenever someone interacts with content they have created and published. For example, when another user comments on a blog you have created, Invotra sends you a notification update. Your employees can be confident they are aware of all important updates and communications. Users can also follow each other to make sure they don’t miss any important activity or content created by a colleague. Notifications are available through an icon on the main navigation bar or under My notifications within My workplace, an area where all content can be located in easy to use categories. Users can organise notifications by time and by activity and all messages are stored forever, for future reference. @Mentioning – When a user is @mentioned within a piece of content, or a comment. Comments – When another user comments on content which you have created such as an event, news content or a poll. Replies – When a user replies to a comment you have posted. Follows – When a user starts to follow you. Likes – when a user likes content you have posted.